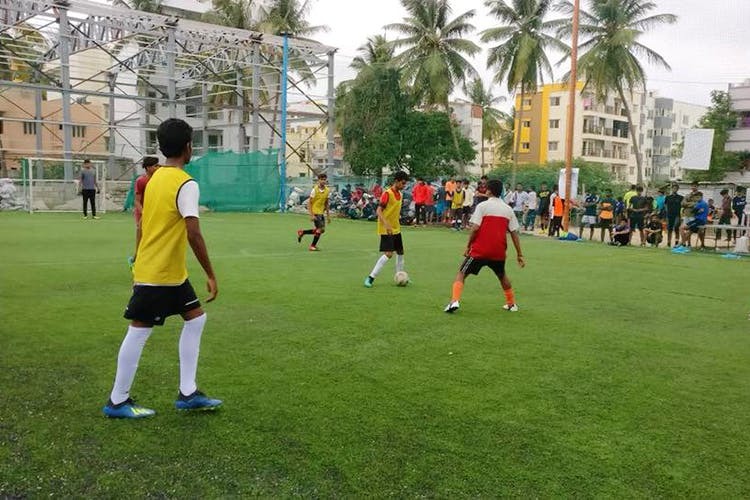 FairPlay arena in JP Nagar is a 24/7 astro turf football field that promotes local talent with attractive rewards and healthy competition. Located in JP Nagar 7th phase is FairPlay Football arena that’s open all day (and night) everyday! The astro turf football field has the capacity for either two five-a-side teams or one seven-a-side team if you book it out fast enough. The arena comes with lockers, showers (and changing rooms obviously), and equipment for rent if everyone’s willing to pitch in for some. Since it's open 24 hours a day, so you can book a slot any time you’re free and have enough people for at least one team (they’ll match you with another team if you call them personally, or you can just book through PlayO). The charges for Monday through Thursday is INR 1,100 per hour for five-a-side, and INR 2,000 for seven-a-side. On Fridays, weekends, and holidays will cost you INR 1,200 per hour for five-a-side, and INR 2,200 for seven-a-side. What’s cool is that the team behind the arena are ardent football fans and host tournaments and their own version of the Champions leagues (where you can win trophies, cash prizes and cool merch!) which you can find out more about when you visit the place. If nothing, just head there when you’re bored to watch some live football for free. They’ve got great rewards programs for regulars and those that display progress, as well as consistently good moves as a way to encourage upcoming local talent, so put your best foot forward!